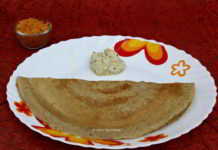 Appearance of this dish’s output looks like Dosa. We people from South Canara side usually call it as Chatti. Though this dish has been nourishing me since my childhood, I only learnt to prepare it after marriage from my MIL. 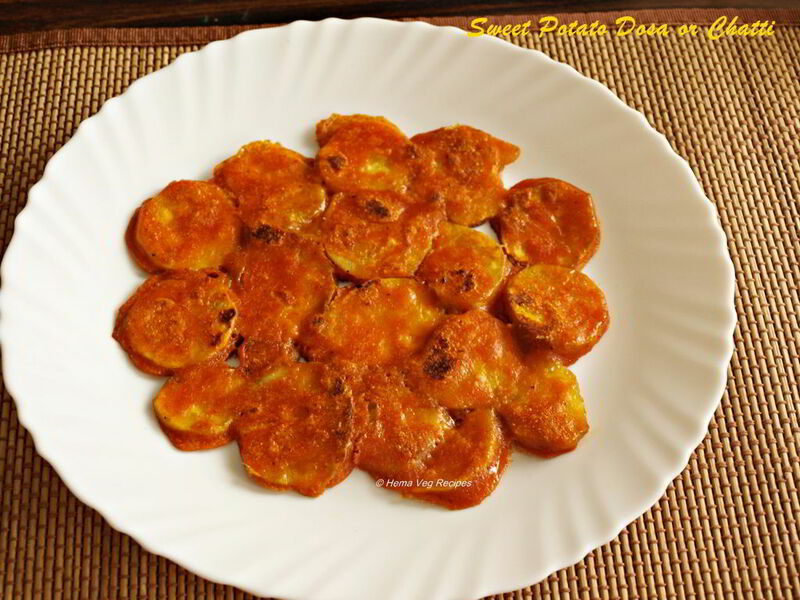 My mother used to do this Chatti using Ridge Gourd or with Brinjal. My friend uses other vegetables like raw banana (Balekai), or Methi leaves. We like this with Ridge Gourd vegetable too. 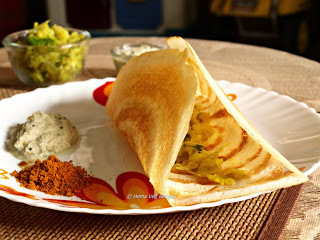 Using Ridge Gourd will make dosa soft, yet it is tasty. It is less time consuming to cook than Sweet Potato. Inspite of giving mutli-nutrients to the human body, these modest vegetables are disliked by some people. If we as mothers make yummy dishes like chatti, I am sure there will be very few in the next generation to detest vegetables. 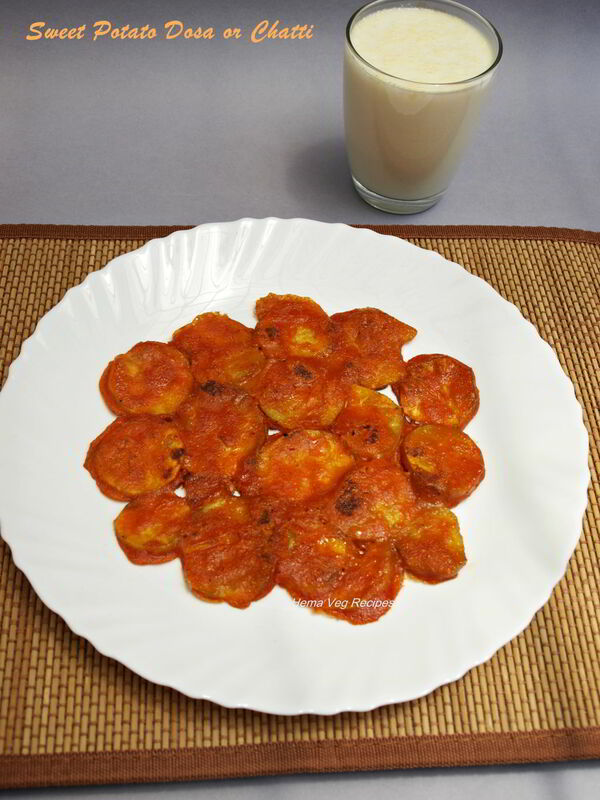 I can say this dish is another way to please children in consuming vegetables. 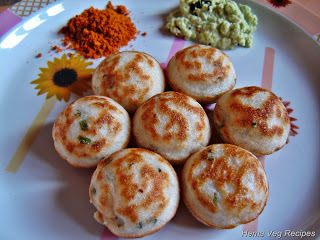 I loved to eat this for lunch as side dish with Sambar rice. Few people will have it for breakfast too. 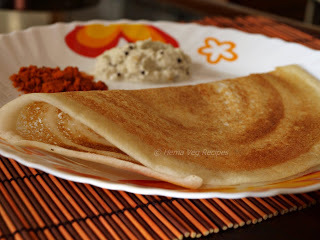 This Sweet Potato Khara Dosa or Chatti is a very filling food. If you have it for breakfast, you can eat only 1 or 2 maximum. For the hurry burry people, this kind of Chatti is the best form of nourishment. Sweet Potato gives good taste than other vegetables in this dosa or Chatti. This batter can be used for preparing the Patrode also. 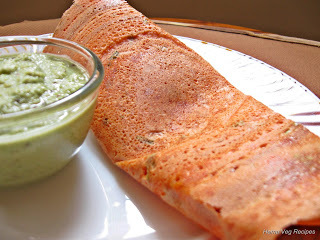 Preparing this Sweet Potato Khara Dosa is quite simple. Planning is quite important. Soaking rice may take few hours, but decide before hand what time you need to make chatti and soak accordingly. Rest of the things (except the vegetable) is just to be added to the soaked rice and grind it to get smooth thick batter. 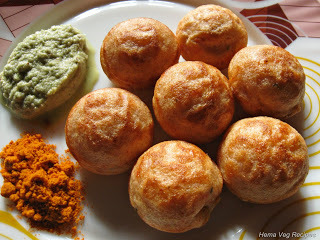 There is no need to ferment this batter before making chatti. Just slice the Sweet Potato in round shape and soak it for 10 minutes in batter. Then take each piece with the batter and arrange it on an oil smeared heated tawa to get the dosa shape. 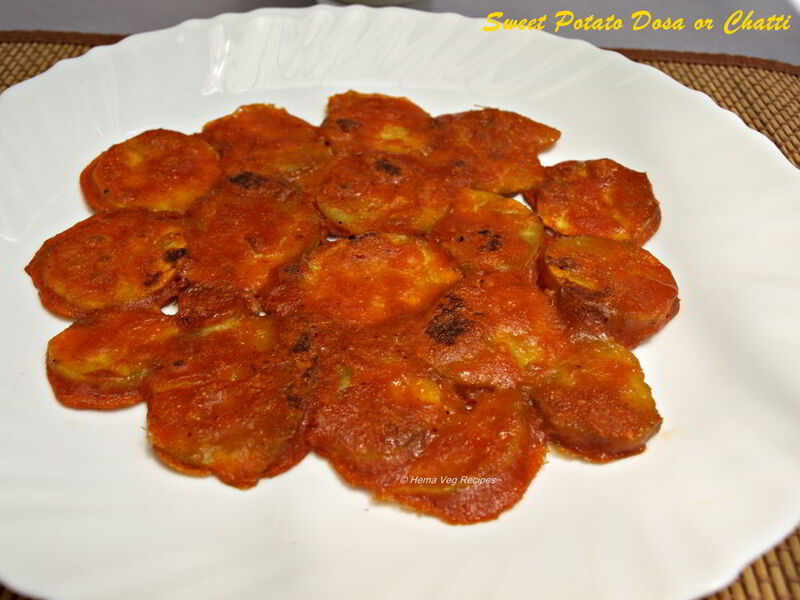 Cook it for 10 minutes and Sweet Potato Khara Dosa or Chatti is ready. Serve hot or warm as your people like either for breakfast or lunch. Since it already contains spice and sweeteners, you need not have any chutney or pickle for side. Yet if one likes, you can give honey for dipping. So try and enjoy this new recipe in your kitchen. 1. Wash and soak the Rice in water for 2 hours. 2. Nearing the end of soaking time, wash and peel the Sweet Potatoes. Slice them to get round shaped pieces of about 2 mm thickness in size as shown in the image. If you notice change of colour to black, transfer the cut pieces into a bowl of water. 3. Dry roast the Urad Dal and Channa Dal separately till you get good aroma or till the colour changes. Do not over roast the dals as you get bitter taste. 4. In a mixer grinder add soaked Rice, roasted Urad Dal and Channa Dal, Jeera, Dhaniya, Tamarind, Jaggery, Salt and Turmeric Powder. Add a cup of water and grind it to a thick paste, adjust the consistency adding little water in between. It should be like thick dosa batter. 5. Soak the cut pieces into the batter and leave for 10 minutes. Meanwhile, heat the dosa tawa, smear the tawa with Oil. 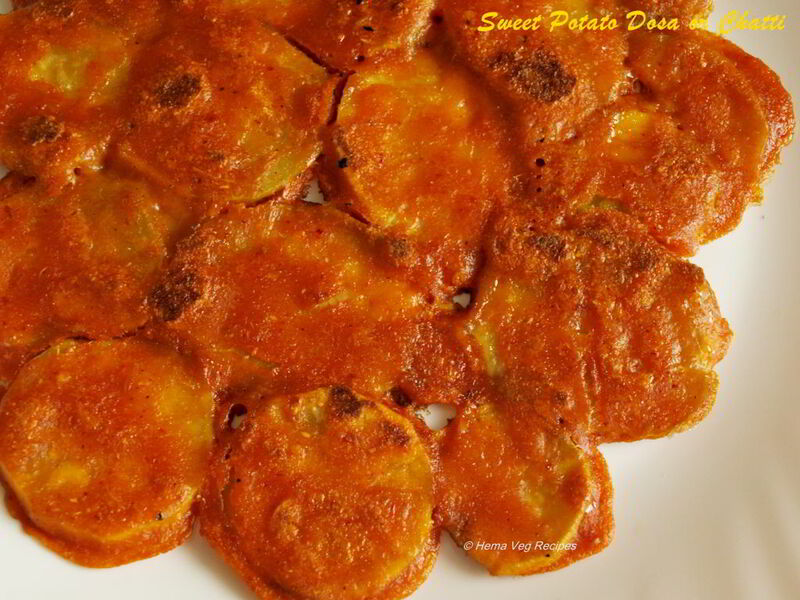 Now using your fingers take each soaked Sweet Potato pieces (with batter coated to it) and arrange one by one attaching to each other in a circle or dosa shape as in the image. Sprinkle a tsp of Oil, few drops of water on this Chatti and close the lid. 6. Cook on low flame. It may take 10 minutes to cook the Sweet Potato well and make it soft. After 10 minutes, open the lid and flip the dosa. Again cook it over low flame for few minutes or until done. 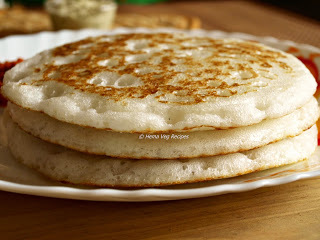 Now the Sweet Potato Khara Dosa or Chatti is ready to for serving. 1. If you are using other vegetables like ridge gourd, brinjal or raw banana procedure is same. For methi leaves you need to chop them into small pieces. Always select tender vegetables. Yellowed one will not be good. 2. Soaking of rice can be extended to maximum of 3 hours. 3. For more spiciness add more red chillies.